In this extensively revised and enlarged edition of his best-selling book, David Suzuki reflects on the increasingly radical changes in nature and science  from global warming to the science behind mother/baby interactions  and examines what they mean for humankind’s place in the world. The book begins by presenting the concept of people as creatures of the Earth who depend on its gifts of air, water, soil, and sun energy. The author explains how people are genetically programmed to crave the company of other species, and how people suffer enormously when they fail to live in harmony with them. Suzuki analyzes those deep spiritual needs, rooted in nature, that are a crucial component of a loving world. 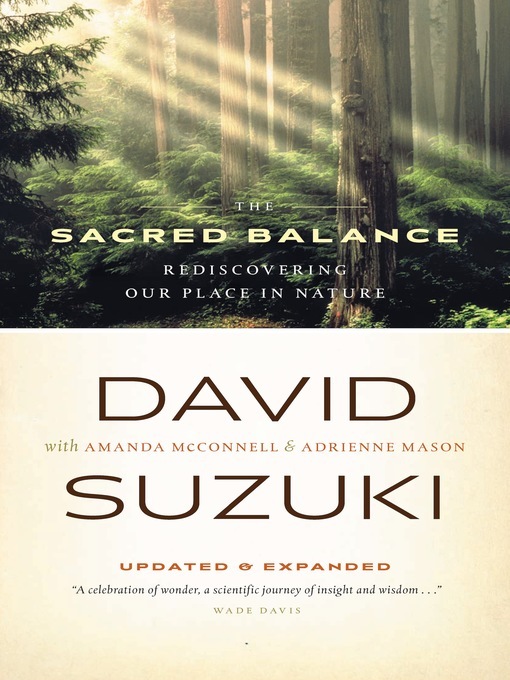 Drawing on his own experiences and those of others who have put their beliefs into action, The Sacred Balance is a powerful, passionate book with concrete suggestions for creating an ecologically sustainable, satisfying, and fair future by rediscovering and addressing humanity’s basic needs.